This week’s Friday Favorite on BeFreeForMe.com is awarded to Enjoy Life Foods, Not Nuts! …Seeds and Fruit Mix. These gluten-free portable snacks are also free of the eight (8) common allergens, and contain NO nuts… which are common in most trail mix varieties. These kid-friendly and allergen-friendly snacks come in two great flavors Beach Bash, a combination of sunflower kernels, pumpkin seeds, dried pineapple, apricots and cranberries and Mountain Mambo, which is my favorite, a combination of sunflower seeds, pumpkin seeds, fruit and chocolate chips (Yes! Chocolate Chips). These tasty snacks are great for allergen-free classrooms or for those with multiple allergies. All these fabulous reasons are why this week’s Friday Favorite is happily awarded to Enjoy Life Food’s Seeds & Fruit Mix. Congrats! Want to buy now? Check out these links on Amazon.com and take advantage of FREE Super-Saver Shipping! This entry was posted on Thursday, March 15th, 2012 at 9:24 pm	and is filed under Friday Favorites. You can follow any responses to this entry through the RSS 2.0 feed. You can leave a response, or trackback from your own site. Sounds like it would be a good snack to carry with you when working , hiking or all most any thing. i can’t wait to try it. 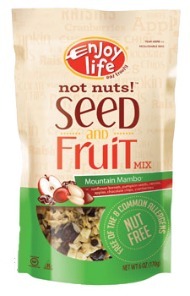 This week’s Friday Favorite on BeFreeForMe.com is awarded to Enjoy Life Foods, Not Nuts! ...Seeds and Fruit Mix.